Bunyas, Kauris and those pesky flowering plants. The Wet Tropics abound with primitive flowering plants, a defining characteristic of the region’s world heritage values. These flowering plants began their evolutionary journey in the late Jurassic, approximately 150 million years ago, and are likely to have had their origins in Australian Gondwana when our climate was warmer and wetter. Recent research suggests we have underestimated the significance of Australia in giving rise to the world’s earliest flowering plants. The Wet Tropics, Costa Rica and New Caledonia are the top three centres of diversity for some of the earliest families of flowering plants. Despite today’s infestation of flowering plants the Wet Tropics are home to another remarkable group of trees that stretch back to the late Triassic, about 200 million years ago. The oldest family of trees still living today is the Araucariaceae. Named after the Indigenous Araucanos peoples of the Patagonian Andes who fought fierce battles with Spanish and later Chilean colonisers, Araucaria forests are today restricted to South America, New Guinea, Australia and New Caledonia. With six species across three genera, Australia is a centre of diversity for this most primitive family of trees, shared only with New Caledonia, which has 19 species across two genera. While the famous Wollemi Pine is restricted to backcountry gorges a few hours from Sydney, the remaining five Australian members of the Araucariaceae occur in the Wet Tropics. This includes the celebrated Bull Kauris of Lake Barrine, the Purple Kauris of higher elevation, particularly along the walk to Kahlpahlim Rock, and the regular Kauri seen throughout the Wet Tropics. These are all of the genus Agathis and were highly prized for their timber and as such heavily exploited. The Hoop Pine, an Araucaria that occurs from Northern New South Wales to the highlands of New Guinea, is found throughout the Wet Tropics and along the east coast of Cape York Peninsula. The remaining Australian Araucaria is the Bunya Pine; an unsung hero of resilience and survival without change for nearly 200 million years. The Bunya Pine, Araucaria bidwillii, is of enormous cultural, ecological and evolutionary significance. Fossils with affinities to Bunya have been found in South America and Europe. The species is as much a relictual dinosaur tree as the Wollemi Pine. While most people who are familiar with this tree know it from the Bunya Mountains in South East Queensland, there are two populations in the Wet Tropics. A small population occurs at Cannabullen Falls in Tully Falls National Park and a larger population occurs associated with the western fall of the Carbine Tableland near Mount Lewis. 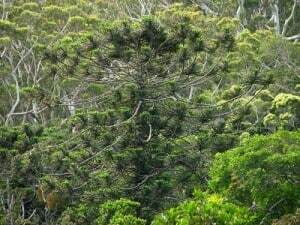 The Bunya Pine can reach a height of 50 meters but is more commonly seen around 30-40 meters. It’s peculiar crown of branches radiate out from a single trunk with clusters of tough foliage at the ends. It is often emergent above rainforest canopy, a characteristic of Araucarias throughout their range, but also occurs in the open eucalypt forest, particularly around Mount Lewis. The North Queensland populations of Bunya Pine are almost certainly remnants of a once much greater Araucarian forest that has waxed and waned over successive ice ages for millennia. Fossil pollen records from Atherton Tableland suggest the last great Araucarian forest in the region occurred about 80,000 – 45,000 years ago. Today, the Wet Tropics’ Bunyas occur primarily on the edges of rainforest where they compete with those pesky flowering plants from both rainforest and open eucalypt forest, a subject that has been a focus of ongoing research for me. While I should have been collecting field data for a research project, I would often lie on a rock and look up at the canopy and ponder the fact that three distinct phases of plant evolution were above me; the coniferous Bunyas, early flowering plants from the rainforest, and the more recently evolved eucalypt diversity.